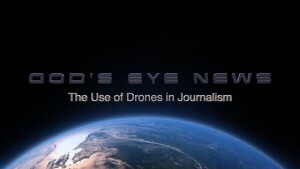 Image from the film God's Eye News: The Use of Drones in Journalism. Illinois State University’s Bob Carroll has been telling stories through the camera lens for decades. Now he turns that camera toward restrictions for drone use with a new documentary called God’s Eye News: The Use of Drones in Journalism. A viewing of the film will be at 6:30 p.m. Tuesday, March 22, at the Normal Theater. God’s Eye News, produced by Carroll, will be shown along with the premiere of Paper: The Editorial Side, a documentary that highlights the workings of Illinois State’s student newspaper The Vidette. A Q&A segment with Carroll and Paper producer Vince Pinto will follow the showings. The event is free and open to the public, though donations will be collected for a Vidette student scholarship. The film includes interviews with historians of aviation and photography, as well as current journalists and freelancers who have used aerial cameras in everything from Super Bowl coverage to Washington, Illinois tornado coverage. “God’s Eye View explores topics from the fearful public perception of drones as killing machines, to the First Amendment rights of journalists to gather information,” said Carroll. Paper producer Pinto is a senior and an interactive media major at Illinois State. He describes his first-ever documentary as an “intimate behind-the-scenes look at what it really takes to produce a week’s paper from start to finish.” A photo editor for The Vidette, Pinto created the 32-minute documentary to combine his two passions: filmmaking and journalism. The film was produced with assistance from associate producer and Illinois State’s Associate Professor Maria Moore. Those with questions about the showings on March 22 can contact Lynn Rossi at lmrossi@ilstu.edu. To reach Carroll, call (309) 438-7780, and to reach Pinto, email vapinto@ilstu.edu.